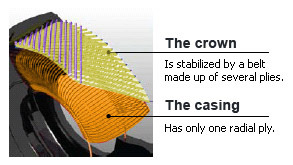 The crown and side wall are formed by the same ply structure. 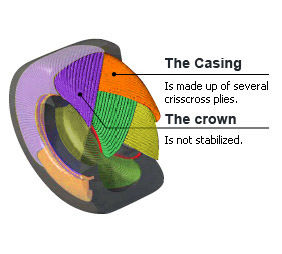 Deformation of the tyre contact area on the ground. The sidewall and tread areas function separately. Less deformation of the tyre contact area on the ground. Less friction with the ground. There is no movement between casing plies. Even ground pressure over the whole contact area. This provides excellent floatation.